In October 2005 Royal Mail responded to customer feedback by reducing the size of the stamps used for Smilers Sheets. The new size was launched with a booklet of pictorial definitives in a self-adhesive booklet. At the time it seemed that they had overlooked collectors and no Generic Smilers Sheet was produced, despite the Smilers being printed by Cartor in litho whereas the booklets were printed by Walsall SP in gravure. This omission is now rectified with the issue of the present sheet. Click on the sheet for a larger image. 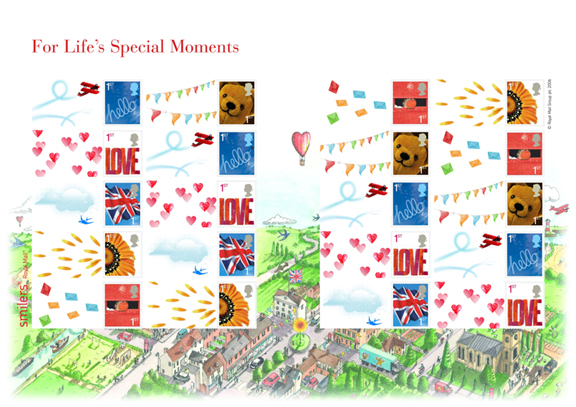 The sheet of 20 stamps consists of 3 sets of the 6 stamps plus additional 'Hello' and 'Love' stamps. For thematic/topical collectors, note the wide range of the border illustrations: biplane, lighthouse, church, wedding, post-van, post box, motor vehicles, bicycles, flag, bird (swallow), canal, boating, fishing, football, children playing, hot-air balloon, teddy-bear - can you find them all!? Designed by Webb and Webb Design, the A4 (297 x 210mm) sheet was printed in litho by Cartor Security Print. All images except FDCs are Copyright 2006 by Royal Mail. Postmarks for use on the day of issue are shown below. 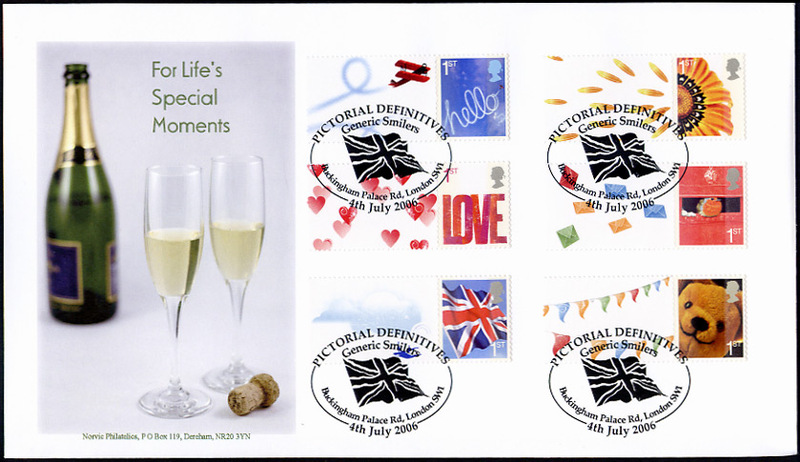 This is not regarded by Royal Mail as a new issue, so no official First Day postmarks and no Royal Mail FDC will be available. All permanent postmarks could be used. We have decided not to produce sets of 4 covers with a column of 5 stamps on each. If you have any questions about these stamps, please email us. 2 0 0 5 2006 stamp issues Visit our online shop!